You know that you need to hang onto copies of your tax returns and your relevant forms and receipts after you file each year, but you may wonder just how many years’ worth of returns you need to save. How long do these forms need to be taking up space in your office? Fortunately, there is a clear answer on this since the laws establish a statute of limitations. What that means is that after a certain number of years have passed, the IRS cannot look at your old tax returns to audit you. When you file a return, the IRS typically has three years to audit the return and make proposed adjustments via a notice of deficiency. These audits are meant for simple mistakes, such as being creative with your deductions or overstating your mileage. The clock starts running on filed returns either on the date the return was filed or the date is was due, whichever is later. That means that if you were an early bird and filed your return in February, the statute of limitations will be three years from that April 15th. However, if you file your return late or get an extension, the statute of limitation will be three years from that date. If you fail to report all your income, the statute of limitations is extended. If you fail to report 25 percent or more of your income — or if you have another dispute that involves 25 percent or more of your income — the statute of limitations for the IRS to take action is extended to six years. The IRS can also ask for an extension on the basic time limit. While the agency is supposed to audit tax returns within three years, it doesn’t always have the resources to get to the returns it has flagged within that time. In those cases, it might send you a letter asking you for an extension, usually of a year. You are not required to agree and I recommend you do not sign the statute extension as it gives the IRS more time to propose adjustments against you. Again, you should consult with a tax lawyer to know the best course of action for your particular case. If the IRS finds evidence that you have submitted a false or fraudulent return, there is no statute of limitations on its ability to take action against you. If you do not file a tax return and the IRS has evidence of income for that year, there is also no statute of limitations on its ability to take action against you. Not only can the IRS slap you with some hefty penalties and interest if it finds evidence of fraud, but it can also bring criminal charges against you, which the IRS has six years to bring from the date you filed your return or if no return was filed, six years from the date the return was due to be filed, which can result in prison time. In most cases, the IRS is going to attempt to resolve the situation with you before you face prison time. However, it is important that you work with an experienced tax lawyer to make sure you are meeting your legal obligations while also protecting your rights. 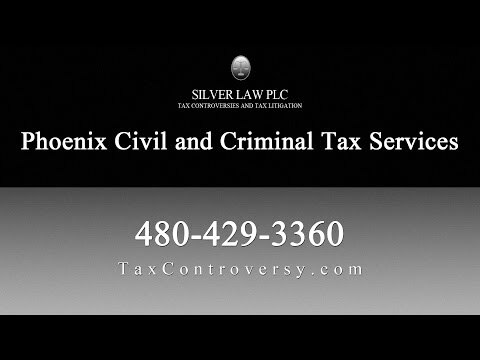 The Arizona tax attorneys at Silver Law PLC represent clients in civil and criminal tax matters, including routine audits, offshore reporting issues, and litigation. Our attorneys can help you resolve your tax issues while minimizing your risk of fines and penalties including jail time. We work to minimize what you owe by negotiating settlements, fighting to have charges dismissed, or helping you find ways to reduce the tax you owe and resolve whatever issues the IRS is scrutinizing. Call us in Arizona to find out how we can help you.